October 29, 2009  The Southern Christian Leadership Conference is choosing a new president. The two finalists are former Arkansas Judge Wendell Griffen and the Rev. Bernice King. She is the youngest daughter of Martin Luther King Jr., who co-founded the civil rights organization and was its first president. October 27, 2009  A heated competition between Northrop Grumman and Boeing for a giant Air Force contract is pitting two regions of the country against each other. Northrop won the contract last year but the Pentagon canceled it after a Boeing challenge. In a new round of bidding, southern politicians are upping the ante with a four-state alliance to lobby for the $35 billion contract. October 13, 2009  President Obama will visit New Orleans Thursday to review recovery efforts more than four years after Hurricane Katrina. Residents say much of the city remains in survival mode. But by most accounts, the pace of recovery has improved under the Obama administration. View From Selma: Can Obama Debate Be Colorblind? September 24, 2009  Some black residents of Selma, Ala., see parallels between the struggles that brought about the Voting Rights Act of 1965 and the current battle over changes to health care. They say propaganda has whites believing if something is good for blacks, it's bad for them. Other Selma residents are frustrated that the public discourse has turned to race. 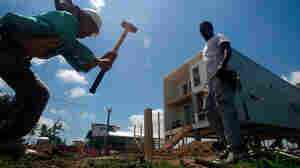 September 21, 2009  Fernando Arriola, a 58-year-old home builder, owns his own contracting business in New Orleans. For a while Arriola couldn't afford coverage, and when he and his wife tried to reinstate it, they were denied even the most expensive catastrophic plan.